Markets look set to erase some of last week's gains as investors lose confidence in Washington's ability to raise the all-important U.S. debt ceiling. U.S. stock futures were moving lower ahead of the opening bell Monday, as investors saw no signs of progress in negotiations to resolve either the debt issue or the partial federal government shutdown. "Just when you thought it was safe to assume progress on the budget impasse, the weekend has proved to be frustratingly slow in terms of positive developments," wrote Deutsche Bank analyst Gael Gunubu, in a client note. "Markets are responding accordingly ... as last week's hope that we would see an early-week deal has evaporated." If progress isn't made Monday, the U.S. bond market could be in for a bumpy ride. U.S. Treasury markets and the partially shut federal government are closed for Columbus Day. In the past week, investors have bailed out of short-term Treasury bills, sending yields spiking. T-bills are typically used by buyers such as money market funds as a risk-free means of stashing cash for short periods of time. What a difference a weekend makes: A surge of optimism about progress in Washington of resolving the debt ceiling sent the Dow Jones Industrial Average up by more than 320 points last Thursday, its biggest point jump since December 2011. 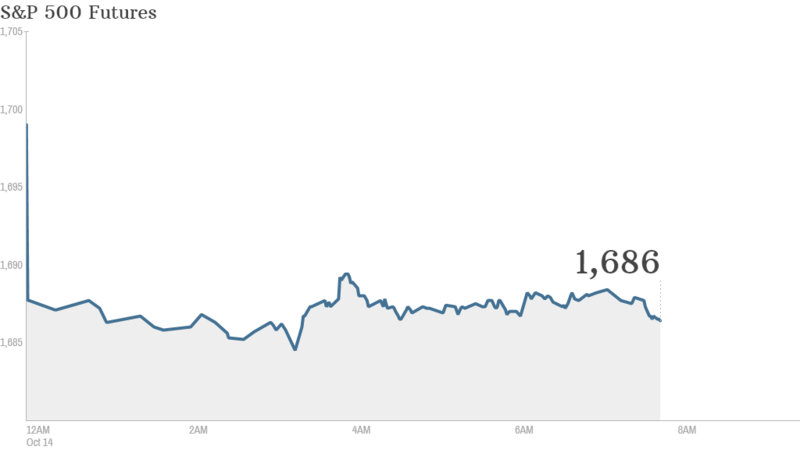 The S&P 500 and Nasdaq delivered their second best advances of the year. Thanks to the big gain, the Dow and S&P 500 ended the week higher for the first time in three weeks. No major U.S. economic reports are on tap Monday. World markets: European markets were mostly weaker in morning trading, reflecting anxiety about the possible fallout from the U.S. political stalemate on the world economy and markets. Most Asian markets were closed Monday. Stock exchanges in Hong Kong, Japan, Indonesia and India were shut for holidays. But the Shanghai Composite index was open, and finished the trading day with a 0.4% gain.